November 2015. The what, why and benefits ... in 2014, the MSA having the highest median age, one measure of the population general demographics, was The Villages, FL MSA with 66.0 years (U.S. overall: 37.7 years, lowest ranked MSA: Provo-Orem, UT MSA 24.6 years). Use the table below to learn about metros of interest to you. These are the most recent data on this subject, available for all MSAs (and the U.S. and states) until September 2016, when these data update. This measure of age is one of 81 measures of general demographics available for each of these areas (see list in scroll section below). 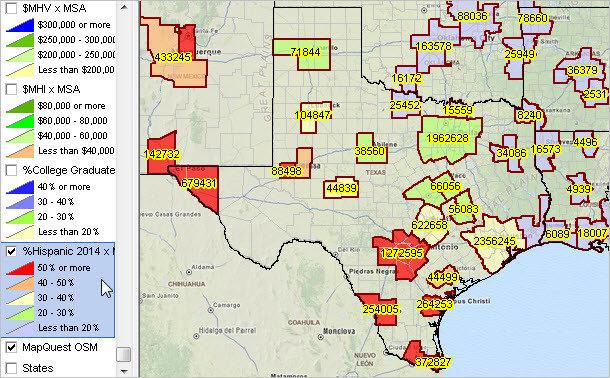 The graphic below shows percent Hispanic population by MSA for the south central region. MSAs shown with bold brown boundary; labeled with item item D066 (Hispanic population). See color/interval patterns in highlighted layer in legend panel at left of map (in larger view). The thematic pattern shows item D066 as a percent of D028 DP1 interactive table below. Click graphic for larger view.